Is there one color that’s been more hated or loved over the years? Think not! Yellow has for long been considered a childish color and has never really won over the general public in our modern day fashion. It’s only logical as yellow is a shade that’s difficult to pull off as the color easily clashes with your skin tone. I do think there are ways to neutralize though, definitely by choosing a shade of yellow that suits you, but also learning how to neutralize it with some styling tricks. When it comes to choosing your shade of yellow, know if you lean towards a more cold or warm yellow. You should also think about the intensity where a baby yellow is better for some whilst other prefer an intense neon. The mustard yellow might be the most popular when done for fall, but it’s also a shade that’s quite flattering and definitely unexpected for spring! A quick tip on how to neutralize yellow is to choose it for an accessory. It will make a cute pop, which is always flattering. Yellow is a color that works the best with white, a light grey and orange if you ask me. It’s also a chic one with denim, which is a material that neutralizes the intensity of yellow. Above all though, yellow is a great splash of energy for spring! The color is also associated with happiness, the sun and intelligence. I mean, pretty good things to embrace huh? This classic color has been trending the past months and is going strong this spring too. Red is a color that suits everyone and I think that’s reason enough for you to try it as well. Enjoy it for sure with stripes, but also a casual duo with some denim. Red and leather is edgy and chic when you want to create a dynamic outfit. This classic color is also a must for your lips and nails, creating a timeless and favorable vibe. Red has been done in the monochromatic style a lot, but also for dresses, shoes and jumpsuits. If you love red but don’t think it’s a color that’s for you, try the red pants! They give some distance to your face, which is often the area of your skin where you decide whether you enjoy the color or not. To give red some extra boost, red is the color of love, passion, power and strength! I think I should at least have some cred for trying to bring some positivity to the color purple. I know it’s not everyone’s favorite, but one of the best parts about a color trending is getting new perspectives on how you can wear it. The trendiest shades of purple at the moment are the lighter shades but also the ultra violet. I’ve written a #Trendalert and also some styling tips in this article. One thing I can add is to stress that this color is a chic one for spring, especially the lighter shades of purple. Going for the pastels are a great way of embracing the sweetness and sophisticated style of the spring season. You can catch some inspiration in this article too! Don’t forget that purple is a color associated with royalty, luxury and calmness. Folks! 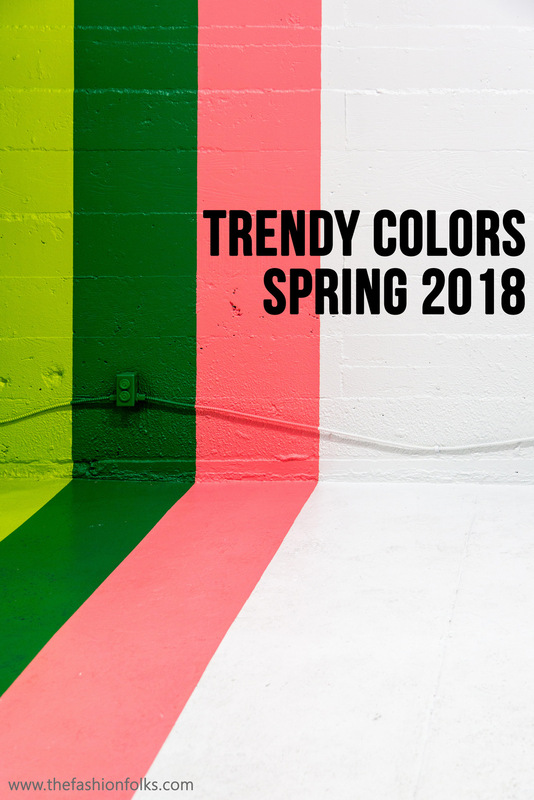 Which one of these three colors spring 2018 is your favorite and why? Let’s chat in the comments! YAY! Long life to vivid colors! Since I moved to Europe I have noticed that in most countries (not all) people do not use too much color as in America and my style has been adopted to that (more black outfits and basic colors). Definitely one of my goals this season is to include more vivid colors to my wardrobe, I would say many people is scared of yellow, but for me this color could give you an upgrade in a matter of seconds! I love these colors and been trying to hunt down more pieces I like in Yellow. Such great inspo! Love the photos you selected to feature too. A pop of yellow is so nice for summer. Have a great week Mia!! I’m definitely into red! I struggle with yellow tones on my pale skin, but purple I’m into as well! I’ve been trying to wear all of these colors this spring! Yellow is my favorite right now! I love mustard tones. I brought a trench in this tone months ago and been waiting impatiently for cooler weather so I can wear it! I’ve been loving yellow lately and have been so excited to see more of it in stores! Love all three colors but red is my all time favorite. I so agree about the use of color! Your fashion photos illustrate this beautifully . I am embracing pink this year and also many of the bright primary colors. I have been seeing these colors a lot! Great roundup and always inspiring.